I’m a talker. Some would say a nervous talker. I chatter. I start conversations easily. I make connections. I find common ground when I talk to someone. What I wrote today still holds true. I could have written the above paragraph when I was a college freshman. I was a fish out of water. I wanted to make friends. I was an English teen living on a college campus in Pennsylvania in the 1980s. In those first few weeks of college, I struggled to find common ground with the girls in my dorm, the kids in my classes, and really with anyone I met. I had almost nothing in common with my fellow freshman. My high school experience was very different. I had not attended prom. I did not have a high graduation. My high school had sports teams, but I had never seen a game. There were no pep rallies. No hoopla. No homecomings. Movies. I found common ground with my new college friends through movies. Now compared to them, I had seen almost no movies. I had literally only seen Jaws, a couple of James Bond movies, ET, Airplane, the first Star Wars movie, and a bunch of other very lame movies. There was no cable TV in 1980s Britain. There were 3 TV channels. One channel only broadcast from noon til 6 p.m.! So really there were only 2.5 TV channels. VCRs were new. I didn’t have any friends who had VCRs. I begged my dad to get a VCR. I eyed that rack of VHS and BetaMax videos in the video store every time I walked home from school.My dad finally agreed in the early 1980s. I was ecstatic! It was a great day in my house when my dad brought home a new VCR. There was only one teeny, tiny problem. He didn’t get a VHS VCR or a BetaMax VCR. Nope. He brought home a VIDEO 2000 VCR. Ooof. 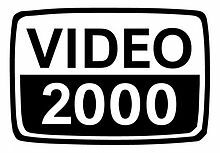 VIDEO 2000 was a new video format player following on the coattails of the far more successful VHS and Betamax. I didn’t say anything to my dad, but my disappointment was palpable. The selection of VIDEO 2000 videos in the video store was limited. For every one VIDEO 2000 there were probably 20 VHS and BetaMax videos. Within months, I had worked my way through all the movies in the rack. The only plus of VIDEO 2000 videotapes was that you could tape on both sides of the tapes. I had hours and hours of Live Aid concerts recorded in 1984 in London and Philadelphia. I watched those Live Aid recordings over and over again. There was no MTV in Britain either. Even though I hadn’t seen many movies, at least had some common ground with my new college friends. We could talk about Star Wars and ET and a few of the James Bond films.